We have a wide range of garden sculptures available that are designed to complement any house and garden setting. 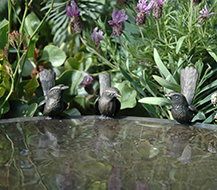 Our specialty is bronze birdbaths and fountains of different sizes. It is also possible to custom make designs and we welcome the opportunity to discuss with you what you would like.